This was a great (and I mean great) system to allow you to combine evernotes into a mindmap-type structure, link and tag them. But it's been dead for at least a year and the domain has finally died. Other software allowed you to pull in evernotes to a mindmap but there is nothing out there currently which does. Why not? It just seems so logical to me, with thousands of notes, to want to mindmap with them. The closest I can get is kanbanote. There really seems to be a gap in the market here. 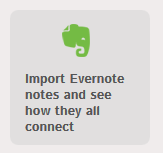 Does the Infranodus all for import of Evernote notes? I can't tell from the website or the demo. Looks like there is a 5 pound donation... is this one-time or monthly?